Half, whole, vertical, specialty, crowns, and structural log replacements – turn to the experts. 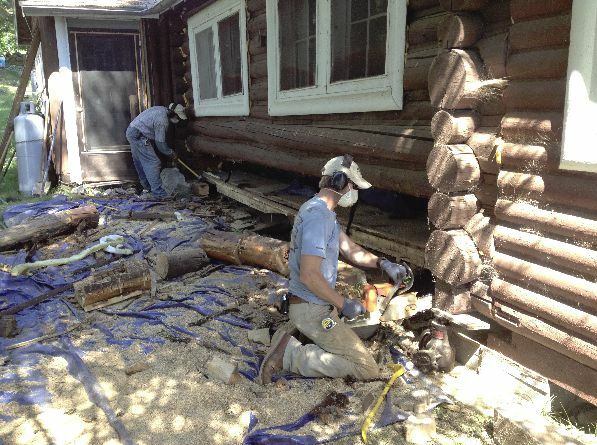 Even with the best-cared for log home or building, replacing logs must be done when rot or other damage takes hold. 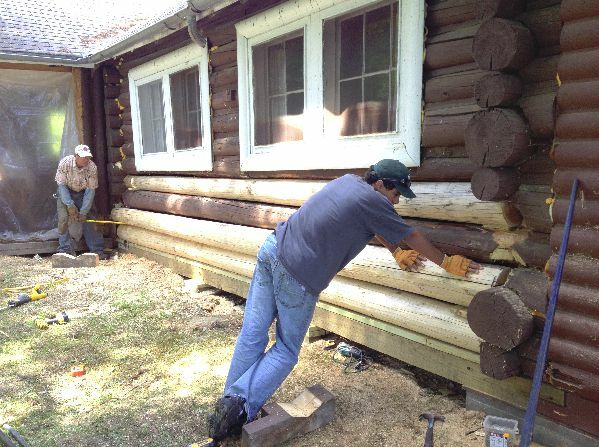 Properly replacing logs on your home or other building requires specialized knowledge, tools and experience. 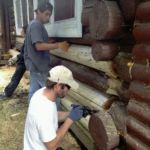 The “art” of replacing rotten logs on just about every part of a log home has been a specialty of our company for over 40 years. We have trained and experienced crews with the right tools to get the job done right the first time. 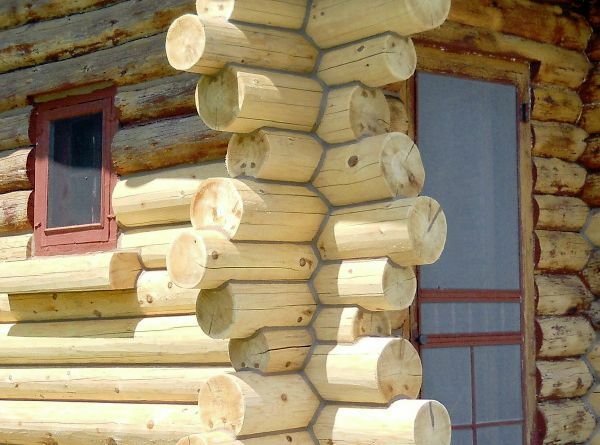 You can trust us with your log home. Some logs are so rotten the entire log needed replacement. Other logs only require a half-log or re-facing. Take a look at the pictures to see the extent of the work that needed to be completed on this house. We use kiln-dried cedar logs for our replacement logs. These logs are guaranteed against rot for 10 years. We also guarantee our work. 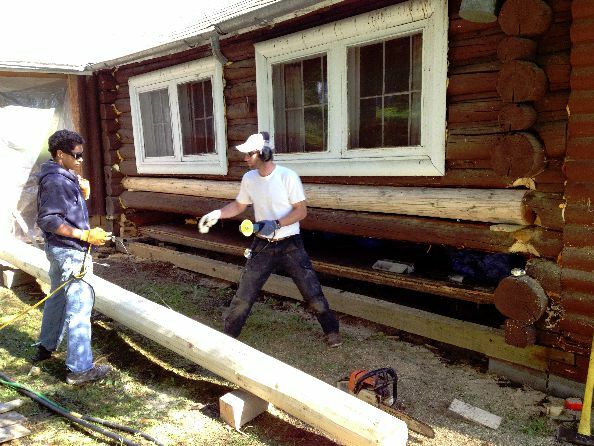 We’ll be happy to talk to you today about replacing logs on your home, or any other log home repair work that your building may need. 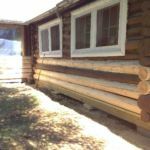 Replacing whole log is one of the most common problems requiring immediate attention on log homes and cabins, and it can be upsetting for a homeowner to hear that they need to have whole logs replaced. However, leaving rotted logs in place only makes things worse. They can’t get better on their own. To prevent rot from spreading, the rotten log must be removed and replaced with a new log. Replacing whole logs is something that only a skilled professional should attempt. 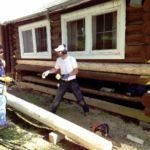 Edmunds & Company has over 40 years of experiencing replacing whole logs, half logs and performing other skilled repairs on log homes and buildings. These logs were rotten deep into the log and had to be removed. Scribing the new lot to fit nicely into the space takes experience. Fitting the new logs into the wall. New logs in place and ready for staining. Rotten logs have been removed and the floor supported until new logs get installed. 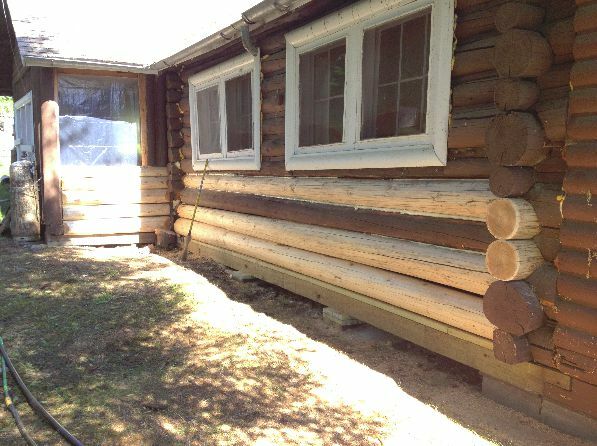 Installing new logs is like working on a large-scale puzzle. They must fit in snugly. When the log is less than 50% rotten from the outside we replace the log with a half-log or “re-facing. The reason we use this technique is primarily to save the inside of the log wall to preserve the look of the interior logs. 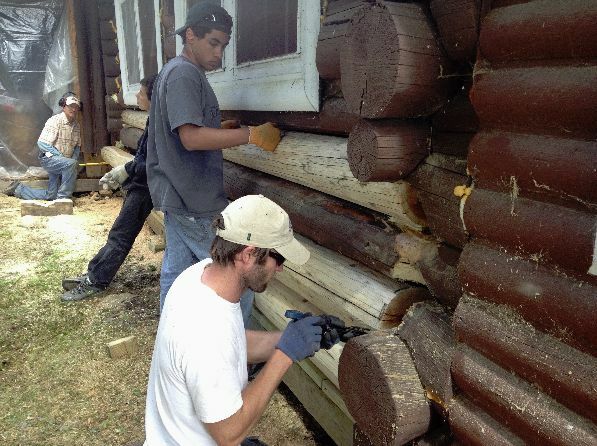 When replacing a half log, new replacement logs are attached to the existing building with galvanized screws. Any spaces between the new and the old logs are filled with expanding foam and/or backer rod and chinked or caulked. The heads of the screws are sunk to a depth of ¼” below the log surface and the hole is filled with caulk matching the color of the log. Barb removes chunks along the log taking care not to go too deep past the rot in the log. 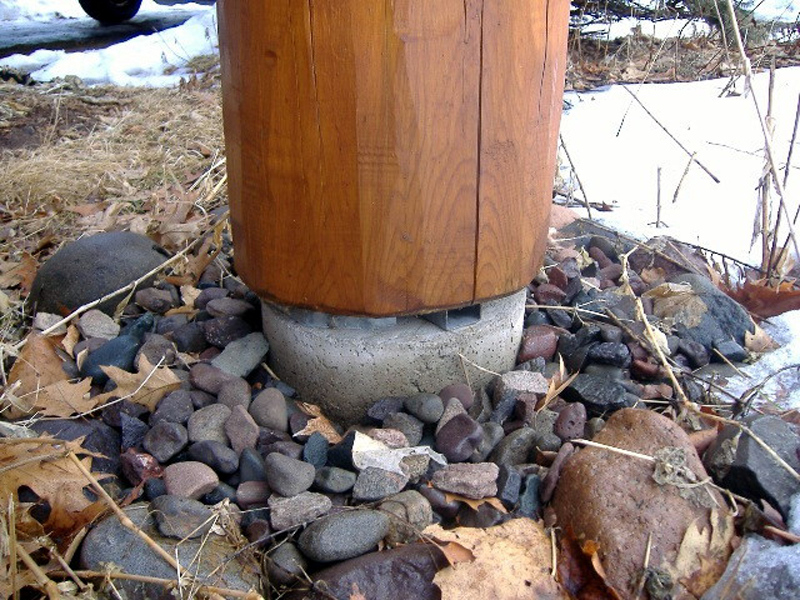 The technique for replacing rotten vertical logs is different from replacing horizontal logs. Depending on the extent of the rot and other factors, there are different methods for doing this type or repair work. Most of the time, vertical logs rot out at the bottom of the timber where the log transitions into the foundation. It’s important to address why the logs rotted in the first place. Many times, the logs sit directly on a cement foundation that wicks moisture up into the logs. Another way is to replace the entire log from the foundation to the roofline. 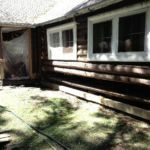 Still another option for fixing rot on vertical logs entails essentially cutting off the bottoms of the logs and putting in a log or cedar “lumber sill”. Gives the house a bit more “freeboard”, i.e. gets it up off the ground. Freeboard is important because when water continually splashes off the ground or some other surface onto the logs closest to the ground, it can lead to rot. Finally, installing gutters can go a long way in protecting against the “splash back effect” because they redirect the water from the roof away from the deck or ground. Log ends, or crowns, are very difficult to replace. 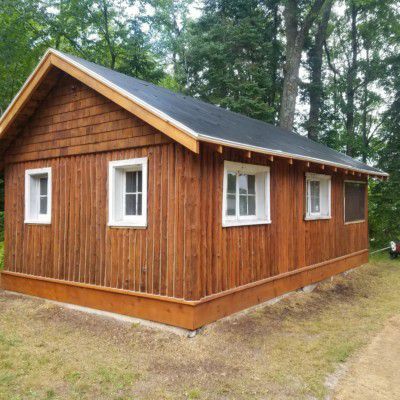 Over the years, Edmunds & Company has perfected the craft of replacing log ends with new cedar logs scribed to fit just the way the old crowns did. We take great pride in making sure that new crowns fit snuggly with existing crowns. When replacing a crown, a cut is made half way back into the intersecting wall. Once the rotten log end is removed, a new piece of kiln-dried cedar log is selected to fit the space and it’s scribed or cut it to match the existing surrounding crowns. This new crown is then fastened to the building with galvanized fasteners. Then it’s chinked or caulked to fill in any gap, making sure that no water is able to travel into the logs. 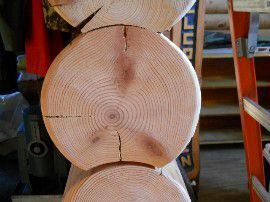 Crowns are significant parts of the aesthetic charm of log homes. Don’t let just anyone replace them if they rot. 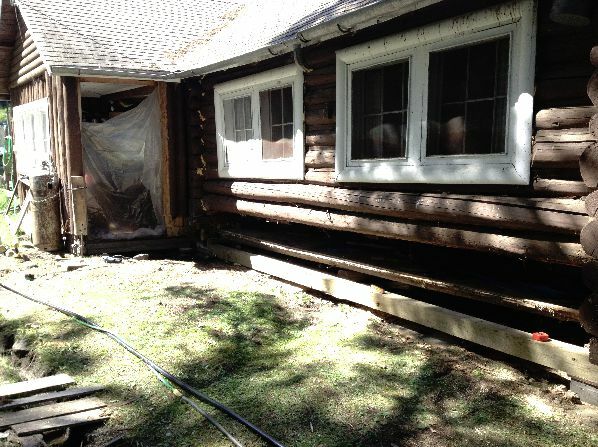 Call on professionals who do this type of log home restoration every day. 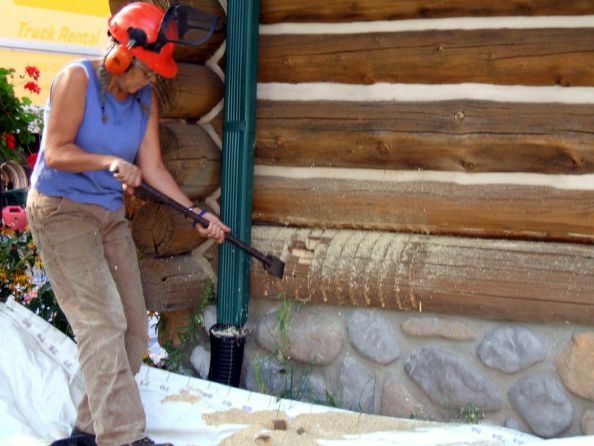 While turned logs, also known as milled logs, have many cost benefits when building a home, the are prone to cracks and checks that other logs aren’t. This creates risk for rot, insect damage, and other issues. If you have problems with your turned logs, we can help. Log siding can and will rot just like real logs. 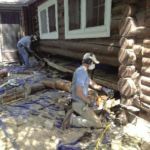 While most times replacing log siding is less labor intensive than real logs, the risks of inaction are high. Vertical posts are particularly susceptible to rot. Often, the bases of posts are left buried in soil or are in contact with the masonry and therefore, they have a tendency to soak up moisture, which causes rot. Since they typically support something above them, it is important to have a professional replace the rotten posts to insure that nothing shifts in the process. This type of spacer is really effective for keeping the bottom of the post dry and free from rot. Edmunds & Company uses rot resistant wood to replace log posts because many times the posts will continue to be exposed to moisture that could put the new logs at risk for rotting. Learn more about our cedar replacement logs. One way to help prevent future problems with rot is to install spacers to get the log ends up off the ground (or cement) to allow air to dry out the end of the log and prevent moisture uptake by the end of the log. Edmunds & Company has the right tools and the expertise to replace any rotten post. 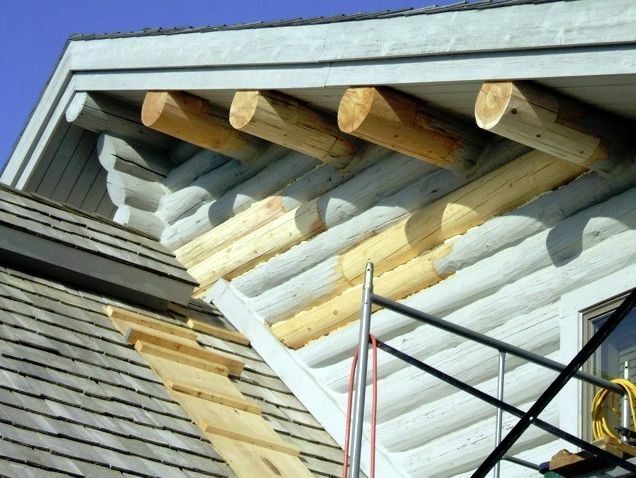 Perlins are roof support members that protrude out of the gable ends of a log home and support the roof structure. In any house they are important – in a log house they are of particular importance. Many times these logs are left extending beyond the roofline for aesthetic reasons and this is the primary cause of decay. While rot can happen to a perlin or ridgepole that is tucked under the roofline, it is much more likely to happen to a log exposed directly to rain and snow. To fix this problem, it is often necessary to splice in a new perlin end. At other times, the log end can simply be trimmed back, which gets rid of enough rot to suffice. It is recommended that the fresh wood be treated with a borate treatment after the rot is removed in order to ensure against future rot. 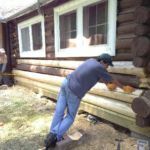 Log Home Maintenance – Cleaning logs, removing dirt is a good thing Log home maintenance can prevent log home repairs…. 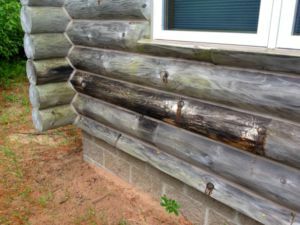 Log rot – Replace log or cover it with siding?